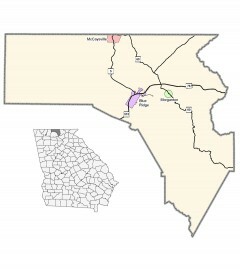 Fannin County was created in 1854 from parts of Gilmer and Union counties. Georgia’s 106th county was named for Colonel James W. Fannin of Georgia, who, with approximately 350 volunteers, fought in Texas’ War of Independence from Mexico. Fannin and his regiment were captured and massacred in 1836. Fannin’s county seat, Blue Ridge, is named for the southern reach of the Appalachian Mountain Range which stretches into the county.